Maren Hassinger. Sit Upons. 2010/2018 and Wind, 2013 installed at The Baltimore Museum of Art. © Maren Hassinger. Courtesy of the Artist and Susan Inglett Gallery. Photo by Mitro Hood. Maren Hassinger: The Spirit of Things, The Baltimore Museum of Art, July 18 – November 25, 2018. A bicoastal artist since the beginning, Hassinger (b. 1947) left her hometown of Los Angeles to begin her formal art education at Bennington College in 1965. Intending to major in dance, which she had practiced since childhood, she was instead pushed towards sculpture. At Bennington, Hassinger was part of a community gathered around the critic Clement Greenberg, who organized exhibitions and conducted seminars, and the modernist sculptors David Smith and Anthony Caro, who exhibited and taught at the school. During these East Coast years, Hassinger also bore witness to the burgeoning shift from minimalism, the dominant mode of American art since the middle of the decade, towards postminimalism, as new processes and materials became fodder for generating a more affective, less depersonalized aesthetic. In 1970, Hassinger returned to the West Coast for graduate school at UCLA; offered a spot in the design program (with a concentration in fiber arts) rather than in the sculpture department to which she had applied, she pivoted once again. The unplanned change of course proved providential, offering the artist new insights into an expanded range of materials. These diverse engagements coalesce in the objects gathered in Baltimore. Maren Hassinger. 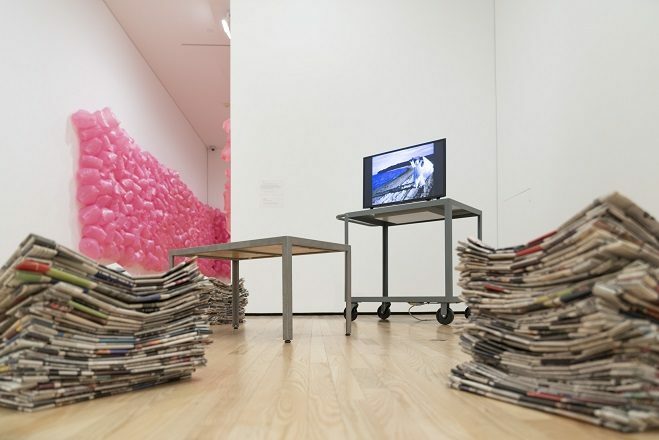 Wrenching News, 2008/2016 and Interlock, 1972/1973 installed at The Baltimore Museum of Art. © Maren Hassinger. Courtesy of the Artist and Susan Inglett Gallery. Photo by Mitro Hood. 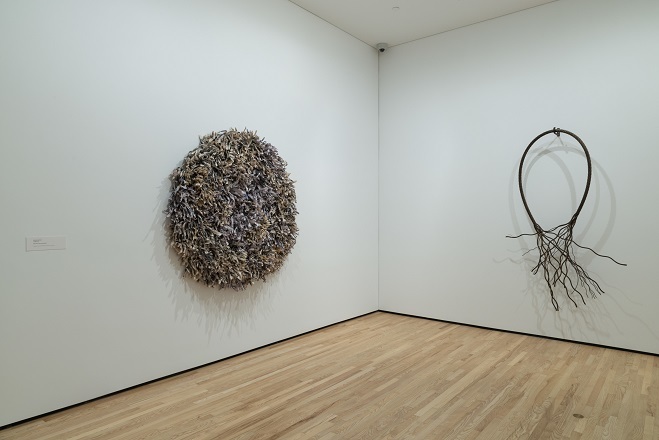 Entering the exhibition, the viewer is met by two circular sculptures made roughly thirty-five years apart. Interlock (1972–1973) is an early example of the artist’s use of steel wire rope, a material privileged throughout Hassinger’s work for its ability to mimic organic form and marry the fluidity of fiber with the austerity of metal. A noose-like oval hangs from a hook jutting out from the wall, its thick rope fraying at the extremities into individual strands, like tree roots or river tributaries. The unraveling of the cord disarms the form’s initially violent charge, even as the seeming delicacy of the steel threads belies the immense effort, supplemented by a welding torch, required to delimit them. Installed on an adjoining wall is the more recent Wrenching News (2008/2016), a tondo of torn strips of newspaper that have been twisted and tied into bow-like bundles to generate an inviting textural field not unlike an oversized shag carpet. The tightly coiled clippings refuse readability: while one might catch a date, a reference to immigration policy, or a photographic sliver of an Olympic medalist, one is struck above all by the artist’s transformational action, her forceful manual response to an ongoing onslaught of information that is, as the title suggests, at times hard to bear. Sourced largely from The New York Times during an eight-year period bookended by—among other events—the presidential elections that first elevated Barack Obama and Donald Trump, respectively, the completed work renders history tactile, registering the passage of time in and as the contrast between the fresher and more yellowed newspaper fragments that comprise its tangled archive. Both objects posit art as a durational, embodied, and potentially therapeutic human action that incorporates the material, cultural, and historical substance of everyday life. Maren Hassinger. The Veil Between Us, 2007/2018, and Whirling, 1978 installed at The Baltimore Museum of Art. © Maren Hassinger. Courtesy of the Artist and Susan Inglett Gallery. Photo by Mitro Hood. Like the first room, the second gallery joins an older and a more recent work. 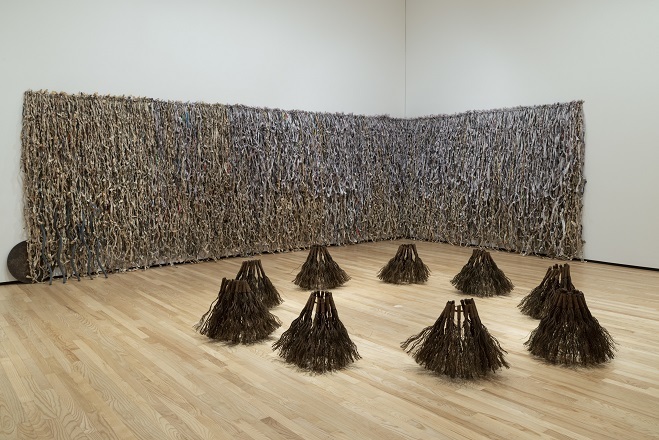 In the center of the space, Whirling (1978) reveals a circle of nine roughly conical clusters of bundled and frayed steel rope installed directly on the floor. Tilting this way and that, the broom-like forms are emphatically anthropomorphic, perhaps recalling hula dancers or, as Valerie Cassel Oliver proposes, the meditative practices of Sufi Whirling Dervishes. Here, the artist transforms steel into a powerful evocation of human motion inextricable from the performative praxis she began developing in the late 1970s with her Los Angeles-based collaborators Senga Nengudi and David Hammons, among other interlocutors. Meanwhile, occupying two of the gallery’s back walls, The Veil Between Us (2007/2018), a curtain of knotted chains of twisted newspaper, also shows Hassinger turning minimalist strategies such as seriality and accumulation toward allusive new ends. Though abstract, certain components along the left edge of the installation assume a quasi-figural quality, suggesting spectators drawn to the collective performance just before the title “veil”: Several pieces of twisted steel rope lean precariously against the wall, emerging like legs from the cascade of newspaper; while further to the left, a diminutive, unfinished steel disc appears as if peeking out from behind the paper barrier like a curious child. Together, the two works offer mutually reinforcing implications of animation. Maren Hassinger. Daily Mask 1997-2004. Courtesy of the Artist and Susan Inglett Gallery. The third gallery, the largest in the exhibition, stages a complex multidisciplinary encounter between works from multiple periods of Hassinger’s career. Two video installations are the room’s standouts. 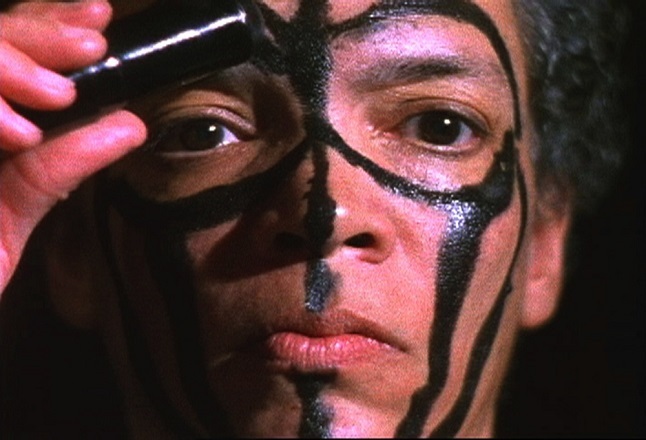 In Daily Mask (1997–2004), the artist, accompanied by the sounds of tribal drumming, methodically covers her face in black makeup–as if performing “blackness” itself. At the film’s end, Hassinger—now all but unrecognizable—faces the camera to assume a series of charged expressions. She first explodes into exaggerated shock, the whites of her widened eyes and exposed teeth evoking racist minstrel performances of the nineteenth century; she then smiles, an expression that contorts in turn into a grimace, her brow furrowed and lips tense; in a final moment, she shuts the viewer out entirely, closing both eyes and mouth. Nearly disappearing into the dark background in the film’s final frame, the artist becomes unreachable, her individuality virtually obscured behind a preconceived category of identity. Across the room, the artist reappears in Wind (2013) with her daughter, Ava. Interlinked visually by entangled limbs and flowing white fabric, the two figures embrace the expressive potential of their gestures in dance-like sequences. Their slow, synchronous movements along a shoreline in East Hampton insist on the continuity between mother, daughter, and the natural world they inhabit, making visible the meaningful relationships through which we come to know ourselves. While each film is compelling in its own right, their pairing powerfully underscores the artist’s ongoing negotiation of the self. Both installations feature several Sit Upons (2010/2018), stacks of hand-woven newspaper pallets that serve as makeshift, moveable cushions enticing visitors to pause. Maren Hassinger. Embrace. 2008/2018 and Birthright, 2005 installed at The Baltimore Museum of Art. © Maren Hassinger. Courtesy of the Artist and Susan Inglett Gallery. Photo by Mitro Hood. The two works in the exhibition’s final room reprise and carry forward themes implicit in preceding galleries. Birthright, a video of 2005, follows Hassinger’s reunion with a paternal uncle, who traces the artist’s lineage back through an incestuous encounter and, ultimately, to an affair between a Southern white plantation owner and a Native American woman. The film opens with a view of the artist’s hands twisting newspaper as she remarks that her “legacy is to feel unloved and it’s interesting to think about how that legacy came down to me,” recalling the manual processing of potentially traumatic information in Wrenching News at the exhibition’s entrance. 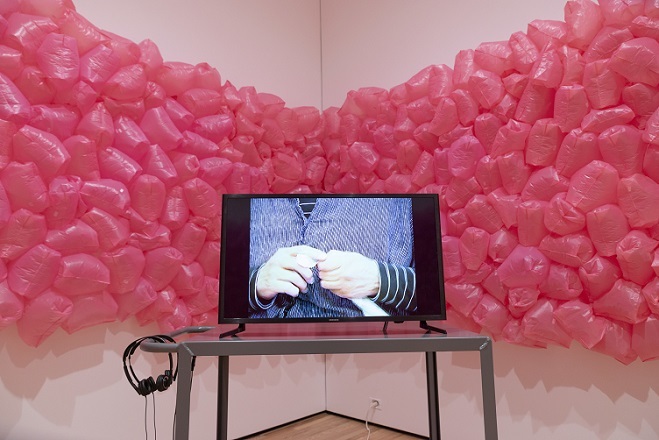 Along the gallery’s four walls hangs Embrace (2008/2018), a panorama of pink plastic shopping bags filled with human breath and small pieces of paper inscribed with the word “love.” Again, the artist mobilizes strategies of seriality and accumulation towards affective ends. Especially when viewed as a background to Birthright, the cellular field of puckered, rose-colored sacs encourages distinctly feminine bodily associations, foregrounding the redemptive optimism of new life as a way to rewrite familial history. In pairing these works, Hassinger restores for herself the love she felt withheld and extends it to her audience, enveloping us in an undeniably joyful perceptual experience. Maren Hassinger, “Passing Through” in Maren Hassinger…Dreaming, eds. Andrea Barnwell Brownlee and Anne Collins Smith (Atlanta: Spelman College Museum of Fine Art, 2016), 20. Valerie Cassel-Oliver, “In Retrospect,” in Maren Hassinger…Dreaming, 100. 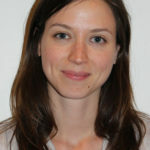 Miriam Grotte-Jacobs is a Ph.D. candidate in postwar American art at Johns Hopkins University. Her research focuses primarily on color field painting and sculpture of the 1960s, with a particular emphasis on artists associated with the Washington Color School and the transnational reception and reconfiguration of American abstraction. Prior to studying at Johns Hopkins, she held positions at the National Gallery of Art in Washington, D.C., and D’Amelio Terras Gallery in New York.